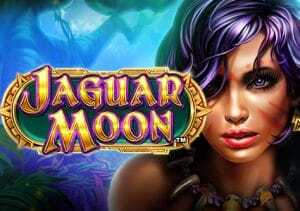 Novomatic returns to one of its favourite hunting grounds, the jungle, in Jaguar Moon. It’s a 5 reel, 243 ways to win video slot that comes with the developer’s typical design and a potentially exciting Free Games feature that awards up to 20 free spins with multipliers that can reach 5x. Play on your PC, tablet or mobile from between 25p and £100 per spin. We’re not usually dazzled by the design of Novomatic-powered video slots and Jaguar Moon is typical of what you’ll find in games from this developer. With lush green, rainforest in the background, the reels are set within a gold frame. Joining the A to 9 royal values are a gold ring, a jaguar paw print and a golden jaguar statue. Top of the payers is the mystery woman who get you 4, 20 or 80 times your total bet if you land 3, 4 or 5 in combination. There’s also a wild. Some Novomatic video slots are extremely high variance. That’s not quite the case here where the volatility is in the medium range. The Free Games feature can still pack a decent payout punch though – this is due to the 5x multiplier which can divvy up payouts of 2,500 times your bet on each free spin. The design here won’t be winning any awards but it does the job well enough. The gameplay is very simple too. The bonus round offers some potential thanks to the multipliers though. If you’re not usually a fan of Novomatic video slots then Jaguar Moon probably won’t win you round. If jaguars are your thing, you’re in luck as you can play Thunderkick’s Jaguar Temple and Playtech’s Legend of the Jaguar which are both excellent.